North Haven's Erica Marriott competes in the long jump during SCC Indoor Track and Field Championship action in New Haven, Conn., on Friday Feb. 1, 2019. NORTH HAVEN—When North Haven senior Erica Marriott entered her freshman year, she never competed on an organized track and field team. But she liked to run and decided to try out for the high school indoor track and field team and explored different events. 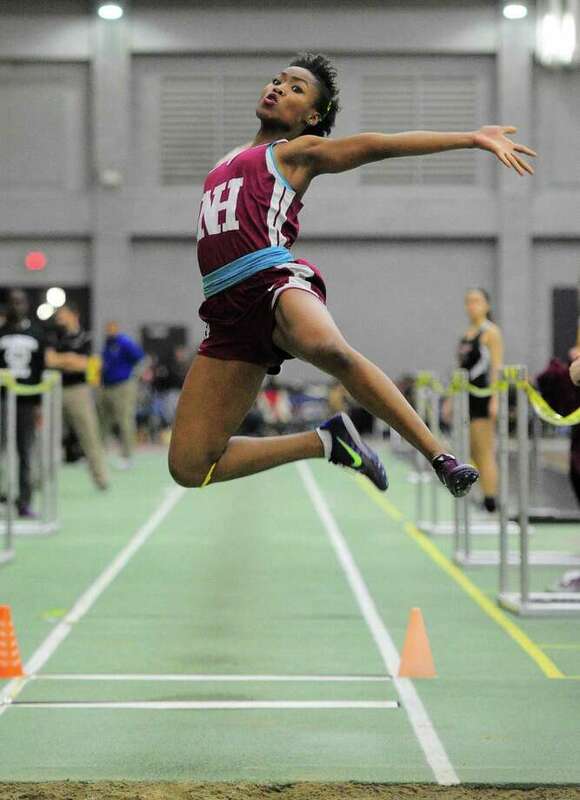 “The first time I saw her run as a freshman, watching her stride and her posture, everything she was doing was from her natural ability and without any formal training at the time,” North Haven boys and girls indoor track coach Marc Celmer said. “When she tried the long jump, she did very well and at that time her jumps came from pure athleticism. She’s a very strong girl. Entering Friday’s Class L indoor track championships, Marriott has developed into one of the top high school girl long jumpers in the state. She is the top seed in Class L with a school-record jump of 17-10.75. Her success on the track hasn’t been too shabby, either. She placed second at the SCC championships in the long jump last week, leaping 17-6. Nyimah Ambrose of Hillhouse won the event in 18-0.75. Her improvement took off in the 2018 outdoor season. At the SCC meet, she was second in the long jump (16-11) and second in the 200 (25.12) and at the Class MM meet she won the long jump (18-4.5) and won the 200 (24.92). Moving on to the State Open she won the long jump (18-1.75) and was third in the 200 (24.85). At the New England meet she set the school outdoor record with a second in the long jump (18-5.75) and she was fifth in the 200 (25.42). “I don’t ever expect to do that well when I compete, I actually put myself down,” Marriott said. “I don’t ever set goals because then you just get disappointed when you don’t meet those goals. I don’t ever think I’m the best out there because then you lose your grip. Last season, Marriott was a New Haven Register All-Area selection for indoor track and field and she was selected the Register’s MVP for the outdoor track and field season. Marriott understands she has natural talent. But she admits it has taken more than that to improve and be successful. Celmer also said Marriott has a handle on the mental aspect of the sport. Marriott said she is focused at her meets. She is left alone, focuses on the event at hand and stays silent the minutes leading into the event. “Erica is an elite athlete with a high energy level beyond the high school level,” Celmer said. “She works well with our girls jumping coach Nancy Shriver and is able to get through anything when she is focused. She is highy demanding of herself and the people around her. Inspiring her teammates is important. Marriott said she prefers the outdoor season because of the sand in the long jump. The sand in the indoor long jump pit tends to be powdery because it is indoor and dry. Despite trying to wet down the sand, Marriott said the powdery sand flies into your face and limits the distance she can get indoors. The outdoor sand stays moist and doesn’t fly into her face. Marriott said she plans to compete in college but hasn’t made a decision yet on where she will go.